Last modified on February 1st, 2017 by Vincy. In this tutorial, let us assume an example scenario and see how we can draw charts for them. 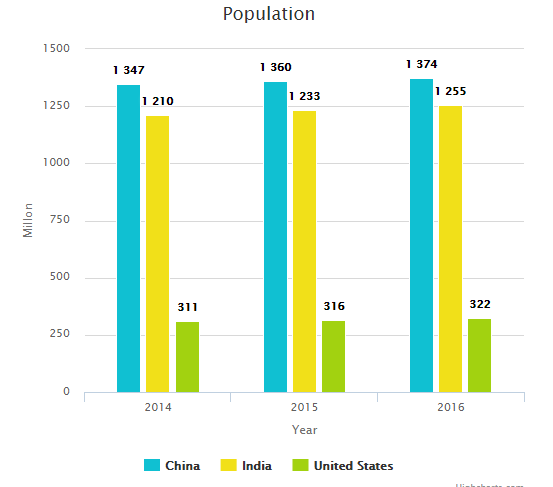 Let’s compare the last three years census data of the world’s heavily populated countries. We will use Highcharts’ column chart to do this comparison. First let’s initialize the X-axis and Y-axis and other default options. After setting required options, we assign the array of countries as chart legend. Then, we push the census data to theHighcharts series option to draw the bar chart. The following HTML has countries checkboxes on which the user wants to compare census data. On clicking the compare button the chart will be rendered onto a target DIV. This target DIV reference is set to the renderTo option. The following code is used to set some default options to draw the chart. Those are, the type of the chart, title, hieght and width, X-axis and Y-axis and more. We initialise series option without any data. After initialising series option we have to set data to these options. In the following code, we set the countries and their census rate to the name and the data of the series option. Also, we set explicit colours to the columns. // Display legend only for visible data.